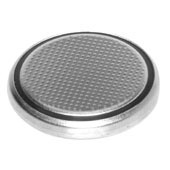 Tiny Remote for iRobot Roomba | Enide! The Tiny Remote is a very compact infrared remote control with only two buttons to control an iRobot Roomba. It produces three different infrared control signals that the robot interprets as Clean, Spot and Virtual Wall/Lighthouse. 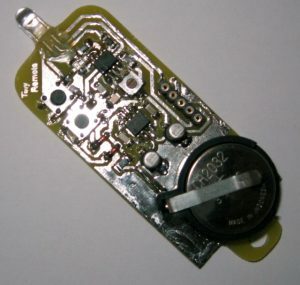 The circuit is built mostly using SMD components to reduce its size, nearly to the size of a keychain and is powered by a CR2032 coin battery. After having designed the virtual wall, I wanted to be able to remotely control the robot. Most of the work had already been done on the assembler software of Virtual Wall so I was left with the tasks of redesigning the power supply and add two buttons. 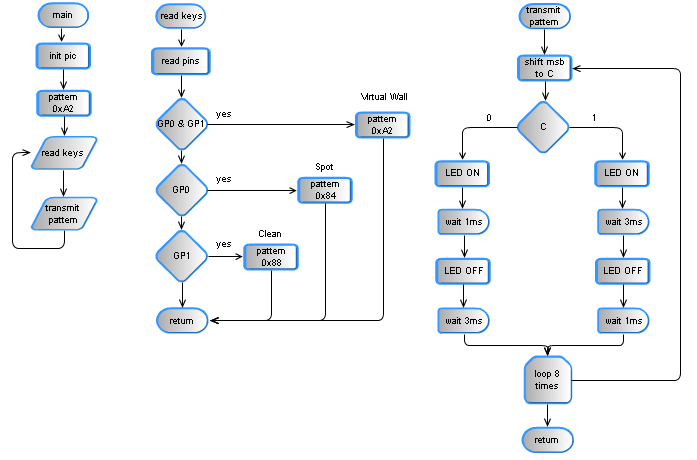 A voltage step-up is needed because 3V are not enough to power the PIC and infrared LED. The infrared patterns emitted by the remote control are a form of PWM, modulated with a carrier frequency around 38KHz~40KHz. Below is a picture of the lighthouse pattern captured using a TSOP1238 and an oscilloscope. Keeping buttons down will repeat its command until they are released. No Stop command is included in the remote because it's not needed! Each command, Clean or Spot, act as start when the robot is stopped and stop when it's already running. Using a PIC microcontroller it is possible to output the infrared pattern and generate the carrier frequency. Mixing is accomplished by connecting the LED between the PWM output and the carrier output. A solution is to use the PIC's master clock oscillator output to produce the carrier frequency. This is the solution proposed by the circuit below. The PIC clock runs at 160KHz (FOSC) using an RC oscillator and the carrier frequency is available on CLKOUT pin as FOSC/4, at 40KHz. From left to right we have the CR2032 3V coin battery, the power supply based on a MAX619 regulator, the microcontroller 12F629, two LEDs, one emitting visible light and an infrared one and two push buttons. Connected to the microcontroller's pin 2 (CLKIN) are R1 and C6 that form the RC pair for the PIC oscillator. There's also a 5 pin header to connect the programmer (an ICD2 or another compatible one). The two diodes D1 and D2 will drive the MAX619 ~SHDN when any button is pressed. The power supply's MAX619 is a step-up regulator capable of providing 5V/50mA from a 3V source. The complete circuit consumes 3.5mA on average and the IR LED peak current is 25mA mostly because the PIC cannot drive more than 25mA on its pins. It is expected that a CR2032 will last some time because the current drawn by the MAX619 is only 10nA. Its recommended input voltage, ranges from 2V to 3.6V but up to 5V are tolerated and small Li-Ion (3.6V) or Li-Po (3.7V) rechargeable batteries are also good choices for powering the remote controller. The software running in the microcontroller will generate three independent commands for the robot when pressing button 1, button 2 and both at the same time. The PCB and Schematic were created using Eagle from Cadsoft. The PCB is very compact, about the size of a keychain and has a hole at the back. The blue line (replace with a wire jumper) and the ICD2 connector are only required for programming the microcontroller. There's no need to add them to the PCB if the PIC was previously programmed. The remote controller uses the same software as the Virtual Wall. It's an assembler program and uses 89 bytes of FLASH and 8 bytes of RAM! There are no interrupts and all timings for the PWM generation are created by counting the instructions time. The PWM routine gets one command byte (0xA2/0x84/0x88) and rotates it through the C flag. Then the infrared bit pattern is produced, waiting the correct amount of time and another bit is shifted through C. The process repeats itself 8 times, for each bit of the command byte. Buttons B1 and B2 are connected to pins GP0 and GP1 respectively and change the command to be emitted. They currently generate Spot and Clean command bytes. When both buttons are pressed, the command emitted is the same as the Virtual Wall.